I started mulling over the concept for a new dish with lentils about a year ago. I got the idea after tasting a great dish by Alain Ducasse, at his Plaza Athénée restaurant: lentils, caviar and a shellfish gelatin. Actually, I had already begun thinking about it a few months before, over a big lentil terrine that reminded me of rabbit liver, in Florence. I’ve always worked a lot with legumes, particularly lentils, which are elements of the territory, affordable and abundant here in Abruzzo. However, for this new dish I did not want to make yet another soup. Preparing a legume-based menu for a special event provided a pretext and an opportunity to develop the idea: sometimes creating a new dish requires calm, other times working under a deadline helps to ‘close’ the concept. Thus was born “Lentils, hazelnuts, garlic and white truffle“. Here’s the procedure: I cook the lentils in water with the addition of onions, celery and carrot and a traditional bouquet garni, in a steam oven at 100 ° C for 40 minutes. I save the cooking liquid and put the lentils aside. Meanwhile I prepare a concentrated stock with water and the same ingredients as before, with the addition of garlic. I divide the stock in half: the first gets densified with the addition of dried porcini, pulverized at the moment, until a gelatin is formed; the other half will be used to “polish” the lentils when it comes time to plate them. Final steps: I prepare a garlic-infused oil, good and strong, and a hazelnut mousse using the cooking water from the lentils, with the addition of sage. I construct the dish with the gelatin on the bottom, with its nice woodsy fragrance, then a layer of hazelnut mousse – this way I’ve got two low-temperature elements, around 12/14C, and two different structures. I then ‘cap’ it with hot lentils, which I will have polished just before by dipping them in the stock. Finally I garnish with marjoram extract, garlic oil and shaved white truffle. This is the second dish of mine where truffle (the other is the Gel of Veal) is essential for harmonizing the flavors without overpowering them. In the Gel it’s black truffle, here I use white, so the aroma is even more penetrating. It’s incredible how, in both dishes, the truffle works with the other ingredients to give balance to the whole. It’s a 100% vegetarian dish, something I find myself gravitating towards on a regular basis: I find vegetables to be always surprising, both for structure and flavor, and by nature they possess two of the main features – strength and concision – I’ve been trying to achieve in my cooking. 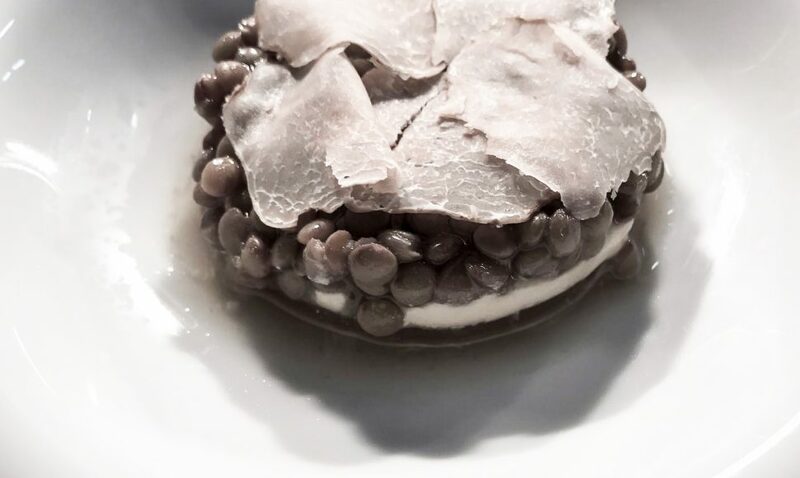 In “Lentils, hazelnuts, garlic and white truffle” there are three main textures: a melt-on-your-tongue gelatin, a silky mousse and finally the lentils and truffle which in contrast almost feel crunchy and at the same time viscous; they incorporate the flavors of the first two layers while imparting an almost smoky note. The first two layers are cold, the lentils are hot, and the truffle is room temperature, but as one eats all layers at once the difference in temperatures – as well as in textures – influences the way the single elements pass on and are perceived by the palate. With its flavors and colors this dish plays as an homage to all things earthy, and reminds me of that sort of tundra that covers our plateaus in the winter. I will write more about the importance of structure and temperature in the construction of a dish, but for now let me close by saying that this new dish wouldn’t work with another type of lentil. Over the years I’ve used lentils from the Santo Stefano di Sessanio area, because I can rely on them for body and character, without them being overpowering (currently I’m getting them from “Sapori di campagna” in Ofena). “Lentils, hazelnuts, garlic and white truffle” has been on the menu for a few days now, but as with all my dishes I know that I’ll continue to change it and fine-tune it until I’m fully satisfied – a condition not easily achieved.